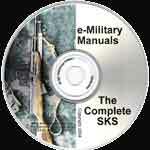 The SKS is a rifle that is in use on a worldwide basis. It is estimated that there may be as many as 2 million rifles in the U.S. alone. If you own one of these versatile rifles, you will want the valuable information on this download. One fine day in 1945, the Soviet Union adopted their newest rifle design by Sergei Gavrilovich Simonov. It was officially designated the "Samozaryadnyi Karabin Sistemi Simonova Obrazets 1945", (which means Simonov's self-loading carbine system model 1945) or SKS-45 for short.